Learning to surf or just visiting Cape Town on holiday but dont have a wetsuit or surfboard? We have surfboards ranging from 5’5 ft all the way up to 11ft, soft tops, fiberglass, epoxy, you name it, we got it. We also have wetsuits to fit all sizes and they are washed everyday after they have been used. Rash vests, leashes, and body boards are also available for rental & purchase. We have a locker room that is monitored by CCTV surveillance where you are able to leave your bags while you are in the water. We also offer daily & weekly rentals! Learning to surf or just visiting Cape Town on holiday but dont have a wetsuit or surfboard? 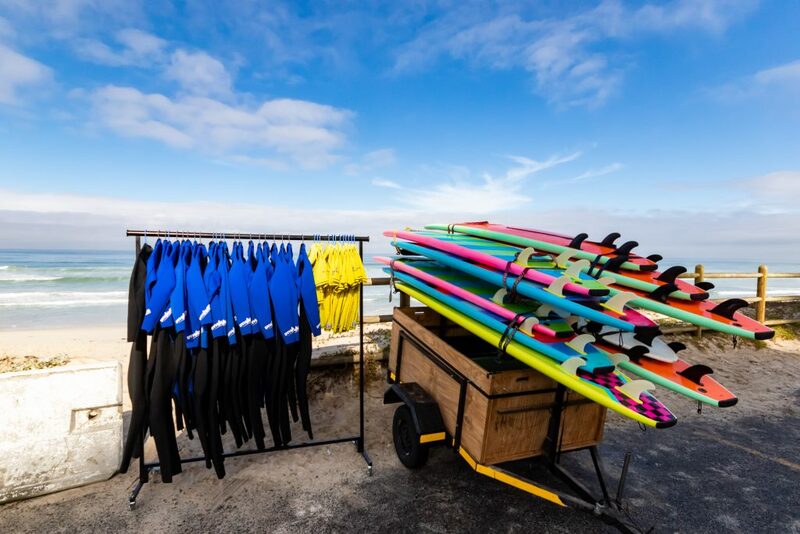 We have surfboards, wetsuits & bodyboards available for rent & sale in all shapes & sizes. We also offer daily & weekly rentals! You will have the famous Table Mountain as the back drop while you surf here and if you're lucky you may see with some dolphins. Learning to surf or just visiting Cape Town on holiday but dont have a wetsuit or surfboard? We have a wide selection of surfboards, wetsuits, bodyboards, fins, & leashes available for rent in all shapes & sizes. We offer daily & weekly rentals and will advise you what works best based on your level of skill. We offer rentals at both Muizenberg & Blouberg! *An I.D or driver's license is required for all rentals and will be returned after your surf. The mission of Gary Surf School is to assist the experience of water sports in the safest and most thrilling way possible, with terrific and impressive coaching as well as equipment hire. Please complete the form below and we will be in contact to make your booking!